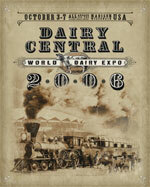 For complete breed show results visit the World Dairy Expo website. 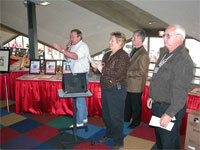 One of the last events yesterday was the Invest In Our Best auction. I’ll try to find out the results and bring them to you this week. I had to leave early yesterday to head home and am waiting on some photos from the Parade of Champions to bring you. Maybe I’ll have those by tomorrow. 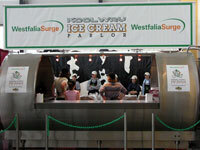 Until then I hope you’ve enjoyed our coverage of World Dairy Expo here on World Dairy Diary. She’s as pretty a princess as you’re going to find and she loves her guernsey cows. She’s Melissa Dinderman from Kent, IL and this year’s American Guernsey Assocation, National Guernsey Princess. 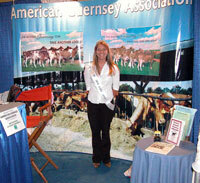 Melissa plans to own at least a hundred guernsey cows after she gets out of school someday. I would be remiss if I didn’t point you to ice cream. Here’s the WestphaliaSurge Ice Cream Parlor. The crew is getting last minute instructions this morning before the crowds arrive. The ring is a very peaceful place even with all the activity. However, I’ll bet if these people all got up and shouted we could get “the wave” started in here today. I mentioned how busy it is in the Coliseum today as the final show is taking place. 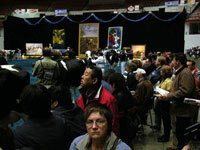 The ringside is a very busy place as people want to get close to the action. Or maybe they’re just huddling together for warmth. Nah. It’s really not cold in here. Just cool!